The fabric is fabulous, but I do believe I need to choose a different, less busy fabric for the background. All those spots are just a bit too much when put together like this. 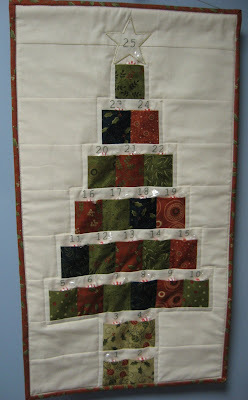 We don't want to send this new baby into convulsions from looking at this baby quilt! I'm thinking the cream solid from the Frolic line would be perfect for the background of the words section of the quilt, then I'll make a scrappy border using the same fabrics as the words. 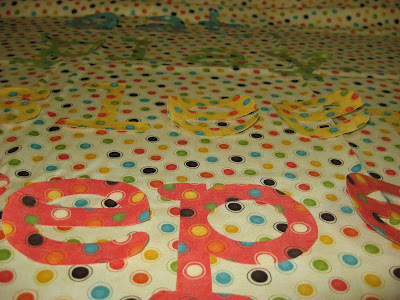 Then for the outer border, I'll use this cream with spots fabric. 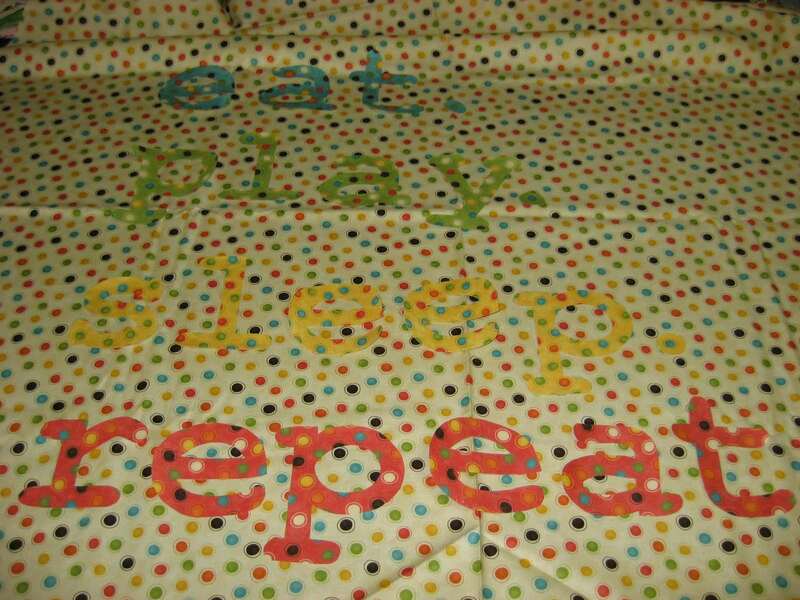 The backing will be the green with spots, and the border will be the blue with spots. So I'm at a stand-still until I can get that other fabric for the background, but at least I got the words all wonder-undered and cut out and ready to press onto the background. 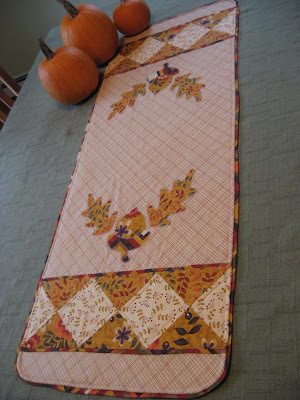 I think that will end up being the hardest part of this quilt, which means that this quilt isn't hard at all! It's a beautiful Labor Day weekend here in New England, so instead of hiding in my basement sewing room, we will probably spend a good part of the afternoon outdoors in the fresh air. I hope you are enjoying your weekend too! 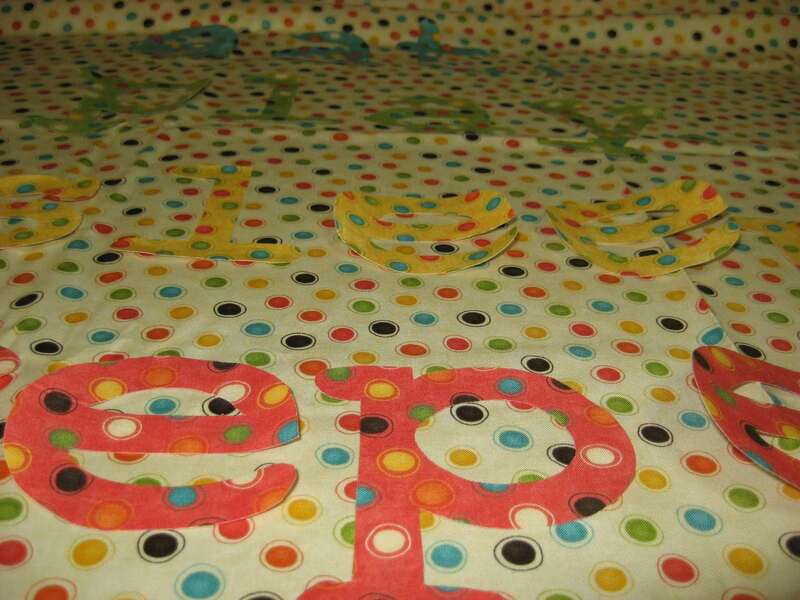 The fabrics really are gorgeous, and I agree that the cream spots is a bit too busy for the background. It reminds me of the color blindness test at the eye doctors! Can't wait to see the finished quilt. I love this pattern and have it in mind when my niece ever decides to have kids... it's right up her alley. 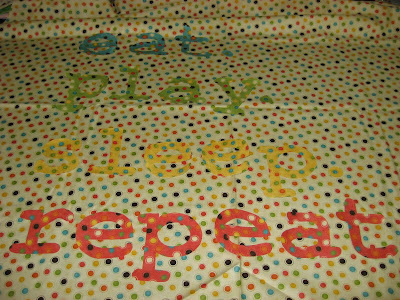 I would go with a solid background - this is going to be a cute little quilt - love the wording. I would love to see a little tutorial on the cutting out and wonder-undering of fine details like the words. How on earth did you do that? Is there a laser cutter or something? Do you stitch them on after pressing onto the background? I would certainly go with a less busy background and your choice of a solid background will do the trick, with highlighted spotted borders.